Santorini is a popular tourist destination. Thousands upon thousands of people flock to the island every year to soak up the sun, the white washed buildings and the sunsets. But Santorini has so much more to offer. Why watch the sunset with 30,000 other people crammed together on a hill when you can sip wine peacefully as it sets? Why eat at one of the crowded, less-authentic tourist restaurants when you can dine where the locals do? While luxury accommodations abound, why not stay in secluded luxury, surrounded by local Greeks and not tourists? 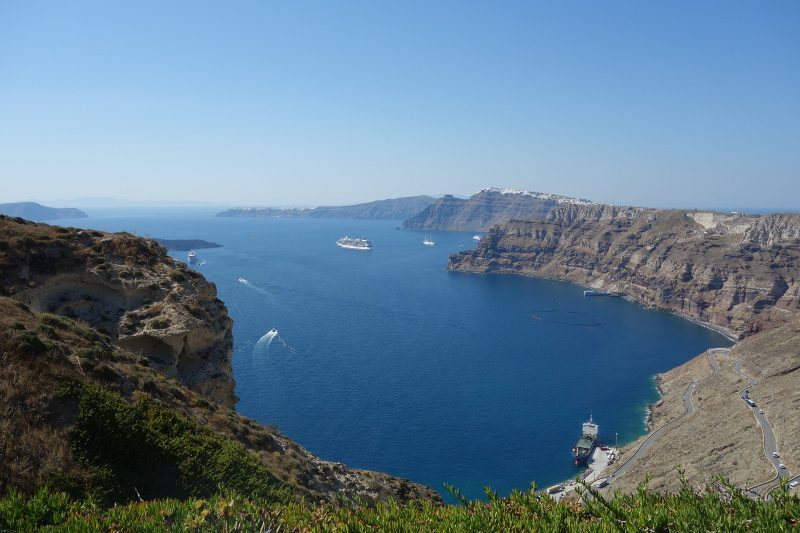 Here are some tips on how to enjoy Santorini “off the beaten path”. Yes, the sun and beaches are tempting but did you know you can go wine tasting? There are currently thirteen wineries spread throughout the island and most welcome visitors with wine tasting experiences that range from modern tasting rooms to outdoor patios overlooking the Aegean Sea to wine tasting in a cave. The main varietal produced on Santorini is assyrtiko. Assyrtiko is a white wine that has very limited aromas but has a strong mouthfeel, ranging from austere minerality and acid to caramel and oxidized notes, and has great aging potential. There are three PDOs (Protected Denomination of Origin) in Santorini, all for white wines. PDO Santorini is a minimum of 80% assyrtiko and 20% can be either athiri or aidani. PDO Nykteri (which means “working at night”) is the same as PDO Santorini but must spend at least three months in barrel (it can also be barrel fermented). PDO Vinsanto )not to be mistaken for Italy’s Vin Santo), must be at least 50% assyrtiko and aidani is added for fruity aromatics. After picking the grapes, they are left in the sun to “burn” for 5-10 days and the resulting wine is a caramel brown color. One other unique thing about Santorini are the vines, which are grown in a kouloura, which means circle or basket. This basket is formed to protect the grapes from the hot sun and strong winds. Established in 1989, Boutari was the first private winery and public tasting room in Santorini. It was also the first exported wine from Santorini. Today Boutari produces wine in six regions in Greece and one in France and all of the wines can be tasted in their tasting room located in the town of Megalochori. Also located in Megalochori, Gavalas was started in the 19th century. George Gavalas is the fourth generation in his family producing Gavalas wine. Today the winery has an all-female winemaking team with agronomist Maria Drakomathioulaki and enologist Margarita Kavamolegou. Venetsanos was the first industrial winery in Santorini and in the Cycladic Islands in the late 1940s. The winery, located in Megalochori, was built inside a cliff, located above the port, in order to use gravity when producing the wine. Production stopped in 1979 until winemaker Ioanna Vamvakouri partnered with the property owners/brothers Nikos and Vangelis Zorzos in 2015 to begin producing wine again under the Venetsanos label. Located in the village of Pyrgos, Hatzidakis is one of the few organic wineries on the island. Founded in 1997 by Haridimos and Konstantina Hatzidakis, Hatzidakis produces assyrtiko, aidani, vinsanto and the red variety Mavrotragano from ten hectares of vineyards. Santo Wine Cooperative, also located in Pyrgos village, started in 1970. Today it consists of 1000 members and produces half of the wine on the island (one million liters). Santo is a popular winery to visit and the tourists pull up by the busloads but it is possible to find a quiet table overlooking the caldera, the large volcanic crater that is Santorini, to taste the wines. Sigalas, a mathematician from Santorini, began producing wine commercially and in 1998 moved to the current property in Oia on the north side of Santorini. Sigalas only grows indigenous varietals (assyrtiko, aidani, athiri, mandilaria and mavrotragano) and is also the only producer on Santorini to plant the vines of the red grape navrotragano in a trellis system, as opposed to the kouloura system. A few days on Santorini can be filled with wine tastings but when you have had enough wine, explore the island by renting a car for the day. It will be tempting to rent a three-wheel ATV but for two reasons, rent a car. First, it is a safer option. Second, the ATVs are slow and block traffic so you will be happier in a car as you wind around the roads. By car, you can drive down to Vlychada, which is located in the southern part of Santorini. While there are beaches all around Santorini, many of the locals say this is the best beach on the island. There is a busy port with fishing boats and taverns, a marina filled with yachts and a beach which is a long stretch of gray volcanic sand with white rocky cliffs. What makes this beach all the more ideal is that it is secluded and quiet for a peaceful afternoon of sunbathing. Vlychada is also home to the Santorini Tomato Factory. The tomato is one of the most famous and traditional products of Santorini and the historical factory has been converted to a museum. Here you can learn about the cultivation, processing and production of tomatoes and tomato paste. If you love food, why not take a cooking class. Selene Meze & Wine, located in Prygos, is a tavern and shop offering premium Greek products. Every day (except Sundays), restaurant manager Georgia Tsara offers a cooking class that includes an introductory lecture about the food products of Santorini, followed by a hands-on cooking class. There is a different theme to each day’s cooking classes and after preparing the meal in the kitchen, sit down for a four-course lunch that you have prepared yourself. While the guidebooks will tell you that Oia is the best place to watch the sunset, you will be surrounded by thousands upon thousands who have read the same thing. But, given that Santorini is an island, surrounded by the sea, there is really no bad place to watch the sunset. To peacefully enjoy the sunsets, pull up a seat at either Venetsanos Winery or Santo Wine Cooperative. Both wineries are located around the center of the island and they sit on top of the caldera, overlooking the island. At either winery, it is possible to find a seat at a table so that you are not crowded among other people. And, what can be better than quietly watching the sunset with a glass of wine in hand? Restaurants and taverns line the streets of Santorini, but I took the advice of the locals as to where I should eat. For a fine dining experience, head to Selene; for a classic seafood tavern, try To Psaraki; for something a little different, try The Bone. Celebrating its 30th anniversary, Selene is a fine dining restaurant and perhaps one of the best on the island. Serving a modern take on Greek food, Selene promotes the usage of local products and the flavors are exquisite. Dishes like a Greek salad and shrimp saganaki are presented in colorful contemporary way. And, the vibrant spinach risotto with leak, kale, sheep yogurt and raspberry, looks like it came from the land of the smurfs. Selene also offers the casual Selene Meze & Wine downstairs for a more informal lunch or dinner. The Bone is a year-old restaurant that utilizes local flavors and local ingredients with an American influence. It is basically a Greek Steakhouse. A modern space with colorful tile floors, blue chairs and a backlit bar, the menu is on an iPad with a detailed description of each dish. If it were not for the view and the use of ingredients like octopus, fava and yogurt sauce, it would be hard to guess this was a Greek restaurant. Situated on the top of the hill in Vlychada, overlooking the marina, To Psaraki was recommended by every local I spoke with. Owner Thannasis Aggeliki offers a menu of simple but clean foods. The menu features seasonal local produce and fresh fish caught from the waters below. Do not miss the ceviche at To Psaraki! Santorini consists of eight villages with Oia and Fira being the most popular villages to stay in. Pyrgos, another of the villiages, is located in the center of Santorini, 7.5 kilometers form Fira, and is one of the most traditional villages of the island. Built on a hill and surrounded by vineyards, it is filled with cobbled streets, neoclassical buildings, a medieval castle and hidden churches. A peaceful village with views of the sea, Pyrgos is an ideal place to stay and explore and offers two styles of luxury accommodations. The Voreina Gallery Suites is a project by Santorinian and archeologist Lefteris Zorzos. After working in London for five years, Zorzos returned to Santorini where he has been renovating accommodations in Pyrgos. Voreina Gallery Suites, perched on a hillside overlooking the Aegean Sea, is a luxury boutique hotel made up of nine modern suites. Each spacious suite includes a kitchen, large bathroom, fireplaces, private veranda and best of all, a private pool. Once you check in here, you may never want to leave. For those traveling with family or a larger group, an apartment or house may be a better fit. Zorzos has also renovated homes in the village of Prygos that can accommodate one to six people. In many ways like AirBNB or VRBO, you rent the apartment or house and have the full space to yourself, including a kitchen and laundry. But, these houses come with many of the same amenities as the Voreina Gallery Suites. There is housekeeping service, a concierge and breakfast is provided at a local restaurant in town, just a two-minute walk. It is possible to get to Santorini from Athens via ferry or airplane. The ferry costs less money but takes between five and eight hours and the seats are inside the ferry with few windows. The flight is a better option as it only takes forty-five minutes. This entry was posted in Food, Lifestyle, Travel, Wine and tagged cooking class, food, Greece, Greek island, Santorini, sunset watching, Wine, wine tasting, Wine Tourist Magazine by Allison Levine.